Effective process validation contributes significantly to assuring drug quality. The basic principle of quality assurance is that a drug should be produced that is fit for its intended use. • Quality cannot be adequately assured merely by in-process and finished-product inspection or testing. As we have discussed effective process validation contributes significantly to assuring drug quality. The basic principle of quality assurance is that a drug should be produced that is fit for its intended use. Pharmaceutical Process Validation Protocol & Report Format Example PPT PDF is given here for autoclave and sterilization. First let us know what is Pharmaceutical Process Validation. Validation refers to establishing documented evidence that a process or system, when operated within established parameters, can perform effectively and reproducibly to produce a medicinal product meeting its pre-determined specifications and quality attributes. It is mandatory to have a system stock list put in place, the appropriate SOPs in place, and additionally to check the critical techniques and their documentation. Having a powerful efficient Computer System Validation System put in place will help ensure the stability of the electronic documents, allocate resources better and subsequently can yield long run cost discounts to the company. 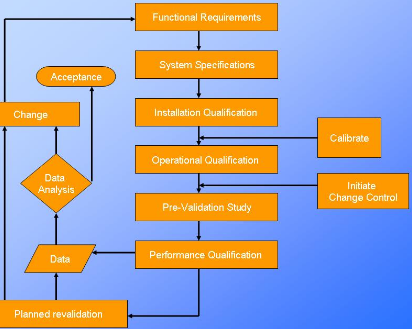 guidance describes process validation activities in three stages. A written plan stating how validation will be conducted, including test parameters, product characteristics, production and packaging equipment, and decision points on what constitutes acceptable test results. This document should give details of critical steps of the manufacturing process that should be measured, the allowable range of variability and the manner in which the system will be tested. The validation protocol provides a synopsis of what is hoped to be accomplished. The protocol should list the selected process and control parameters, state the number of batches to be included in the study, and specify how the data, once assembled, will be treated for relevance. The date of approval by the validation team should also be noted. In the case where a protocol is altered or modified after its approval, appropriate reasoning for such a change must be documented. Successful completion of this protocol will provide documented evidence that all key aspects of the Autoclave used in LARGE VOLUME PARENTRALS SECTION adheres to appropriate application criteria, comply with standard operating procedures, and meet current Good Manufacturing Practices (cGMP) requirements. The signature below indicates approval of this protocol and its attachments for execution. All individuals participating in the execution of this protocol must fill out a row in the table below. with all the details like Name & Designation, Responsibility, Signature & Initial along with the Date of the process. · Complete all items on a form in full, except the optional comment’s section. · Document any deviation from defined protocols and expected results. Owner approval of protocol deviations must be documented before final approval signatures can be obtained. · Write additional comments on an addendum sheet when there is not enough space on a form to accommodate all comments. Use these three steps when adding an addendum sheet. 1. Number the page alphanumerically. 2. Initial and date additions. 3. Insert the addendum sheet behind the original page. · Make all entries in permanent black or blue ball pen. 1. Draw a diagonal line, bottom left to upper right, through the miss entered or incorrect information. 2. Write the correction to the upper right of the original entry. 4. Initial and date the change. 2. Write the correction on a separate addendum page. 3. Give brief explanation of change. 4. Initial and date the changes. 6. Place the addendum page behind the original page. Mark each element carefully according to the instruments below, so that it will be clear that the element is unnecessary and that you have not skipped or forgotten the element. 1. Draw a diagonal line, bottom left to upper right corner, through the element that is not required. 2. Write the letters NA [Not Applicable], your initials, and the date above the line. Include comments above the line or on the form to document the reason the element is not required. 3. Where NA is indicated as an option, select this field. The performer and reviewer must sign and date all forms, as usual, even when part or all of the form is marked “NA”. Note: All original entries must remain legible after any corrections have been made. · When a Instrument modification has been completed, it affects the installation qualification. · When this Instrument is being removed from where it was originally installed. · For a pre-determined period of time or use. · After any minor service has been done or replacement of parts. · Prepare and approve the validation protocol. · Provide training to the personnel regarding protocol execution. · Generate amendment to the validation protocol, as required. · Document any deviations that occur during protocol execution. · Document Operator SOP Training. · Provide the resources required in executing the validation protocol. To verify and establish that the Autoclave is working as per recommendations of the manufacturer. This validation protocol is applicable to the Autoclave intended to be used for steam sterilization in LARGE VOLUME PARENTRALS SECTION. § Prior to the production of a new sterilizer. § A change In the load design or weight that would result in a load that is more difficult to sterilize. • Selecting utilities and equipment construction materials, operating principles, and performance characteristics based on whether they are appropriate for their specific uses. functions, and properly connected and calibrated). • Verifying that utility systems and equipment operate in accordance with the process requirements in all anticipated operating ranges. § Place BIs (Biological Indicators) at each of the slow to heat penetration location. § Perform, function check of TC .replace if defective. § Set potentiometer for a 3.0 Hours scan cycle. § Allow cycle to continue until it is completed. Collect all potentiometers, controls and computer control record and place with protocol. All four colors segment of the processed indicator are black. If all other critical process parameters such as temperature, pressure and sterilization are in accordance with cycle reference. No growth should be observed after incubation for 48 Hours. 1- Evaluation of the BDS strip. If No or N/A, explain in Comments. To document any discrepancy or variations noted during the execution of the Process Validation Protocol. Any action to be taken to resolve an outstanding issue is to be identified within the incident report. This sheet is a record of each individual who signs or initials any page included in this protocol or in the attached document. Each person shall be identified by typed or printed name. This document certifies that the process of Autoclavation has been validated as specified and complies with Standard Operating Procedures, and satisfies the requirements for cGMPs. In conclusion, there is far to think about about your Computer System Validation system last to a strong inspection. Make every effort to have a system stock list put in place, the appropriate SOPs in place, and additionally to check the critical techniques and their documentation just before a powerful FDA inspection. Again, simply because the FDA can be inspecting the institution for other factors, doesn’t discount the potential the couple need to audit your pc System Validation School. As mentioned, so many of our businesses respective company procedures are carried out by way of electronic systems in this young age of technologies. Therefore, it could be useful to evaluate the Computer Validation Program whether you foresee a strong inspection or otherwise not. Having a powerful efficient Computer System Validation System put in place will help ensure the stability of the electronic documents, allocate resources better and subsequently can yield long run cost discounts to the company. ultimately support the release of a product to commerce. continued process verification. Studies during these stages must conform to CGMPs and must be approved by the quality unit in accordance with the regulations . process design. We recommend that firms diagram the process flow for the full-scale process. design progresses to facilitate comparison and decision making about their comparability. In conclusion, there is far to think about about your Computer System Validation system last to a strong inspection just before a powerful FDA inspection. Again, simply because the FDA can be inspecting the institution for other factors, doesn’t discount the potential the couple need to audit your pc System Validation School. As mentioned, so many of our businesses respective company procedures are carried out by way of electronic systems in this young age of technologies. Therefore, it could be useful to evaluate the Computer Validation Program whether you foresee a strong inspection or otherwise not. Acceptance Criteria Agreed standards or ranges, which must be achieved. Critical Instrument Any instrument that directly affects product safety, purity, or efficacy. Direct Impact System An engineering system that may have a direct impact on product quality. Factor Acceptance Test Documenting the performance characteristics of equipment prior to shipment to site. Impact Assessment The process of evaluating the impact of the operating, controlling alarming and failure conditions of a system on the quality of a product. Indirect Impact System An engineering system considered not having a direct impact on product quality. Installation Qualification Documenting the process equipment and ancillary system are constructed and installed according to pre-determined specifications and functional requirements. No Impact System This is a system that will not have any impact, either directly or indirectly, on product quality. These systems are designed and commissioned following Good engineering Practice only. Non-critical Component A component within a system where the operation, contact, alarm or failure may have an indirect impact or no impact on the quality of product. Operating Limits The minimum and /or maximum values that will ensure that product and safety requirements are met. Operational Qualification Establishing confidence that process equipment and ancillary systems are capable of consistently operating within established limits and tolerances. Performance Qualification The documented verification that al aspects of a facility, utility or equipment that can affect product quality perform as intended meeting pre-determined acceptance criteria. Performance Testing The process by which the performance of interdependent system is demonstrated as within the required tolerances, the output of interdependent system is demonstrated as delivering the required duty or capacity, the interdependent functions of system are interdependent to be as specified and appropriate. Diagrams Primary source of design information for utility systems and process equipment. They are used to depict the process flow, equipment configuration, process parameters, instrumentation, and materials of construction. They also are used to perform overall material and energy balances and pressure balances. Commercial manufacturing process: The manufacturing process resulting in commercial product (i.e., drug that is marketed, distributed, and sold or intended to be sold). For the purposes of this guidance, the term commercial manufacturing process does not include clinical trial or treatment IND material. Concurrent release: Releasing for distribution a lot of finished product, manufactured following a qualification protocol, that meets the lot release criteria established in the protocol, but before the entire study protocol has been executed. Process design: Defining the commercial manufacturing process based on knowledge gained through development and scale-up activities. Process qualification: Confirming that the manufacturing process as designed is capable of reproducible commercial manufacturing. Process validation: The collection and evaluation of data, from the process design stage through commercial production, which establishes scientific evidence that a process is capable of consistently delivering quality products.